The winters marks the arrival of cozy blankets, hot coffees and soups, plus some major peanuts paired with a movie night. Getting out of your hoodie and socks is like a torment, I mean who would want to step out of these warm babies? However, there are some people who give us style goals, Pakistani celebrities manage to up their game and flaunt those winter outfits flawlessly. These people might actually motivate you to step out in some leather jackets and a cashmere – cutting a dash. The lead of Balu Mahi looks chic in this leather jacket, boots, and that fabulous scarf wrapped around adds that oomph to her complete attire. Ever since the YouTube funny man switched over to TV and movies he has managed to set the cinema on fire! It’s no newsflash that the actor has an eerie resemblance to Orlando Bloom, he actually looks pretty damn handsome in this jacket! The saucy actress is very well knows for her uber dressing sense, with that Burberry scarf paired with a long cream coat – Malick looks like she just walked out of a ramp. She looks super pretty bare faced too.. The Janaan and Yalghaar heart throb can make any woman weak in the knees (you know that already!) A leather jacket gives him that bad boy look and we love it! How adorable does this starlet look posing with the life-size Olaf? The bubbly actress has the spark of making everything look terrific, all she needs to do is spin her magic wand! The puffy jacket paired with those Adidas sneakers are love. Good Morning from me & Olaf! ???? Rise & Shine ????????? #Sunkissed #FridayBliss ???????? Not only she has a nightingale voice, she’s also a fashion diva. Add this beige coat on your shopping list if you intend to flaunt yourself this winter. Infinity love maybe? This model sure knows how to make hearts skip a beat. Those boots, woolen scarf and sweater proves that she dresses to kill. Off to work! Bye bye! ???????? #jahangirtomb #lahore #winters #happy ???? The woman is a natural style guru..
How dapper does he look in this leather jacket? The actor can very very easily dazzle you with his oh-so-chivalrous personality! Shining winter blues on fire !! ???? This Cinderella (pun intended) can pull off literally any look, whether it’s an ethnic salwar kameez or an evening dress, the starlet looks glamorous. The combination of long coat with black boots is slaying! Some last moments in Glasgow???????? #winter? ?Scotland #neverendingposes #liveyourlife #mayaali???????? Though her bright smile was enough for us to add her in the list, her attire was another cherry on top. 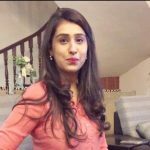 The Bulbulay’s Khoobsurat actually does justice to her name in the show. With that jacket and scarf, Ayesha looks elegant and chic altogether. She should begin mentoring on fashion.